DIRECT SUPPORT PROFESSIONAL III - High Medical NeedsSTATUS: Full-Time or Part-Time / Non-exemptLOCATION: Brainerd, MN Josh’s Place (JP) is a MN disability service provider known for its personal mission driven, quality supports and fun work environment. JP is hiring caring and supportive Direct Support Professionals (DSPs) to join our team in a high medical needs work environment. As a DSP, you will support JP individuals (VIPs) while doing meaningful work that truly make a difference in the lives of many. Class A CDL preferred but may train the right people. 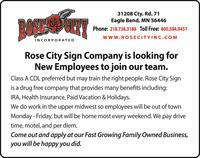 Rose City Sign is a drug free company that provides many benefits including: IRA, Health Insurance, Paid Vacation & Holidays. We do work in the upper midwest so employees will be out of town Monday - Friday, but will be home most every weekend. We pay drive time, motel, and per diem. 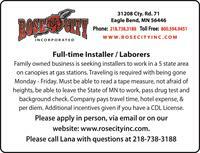 Come out and apply at our Fast Growing Family Owned Business, you will be happy you did.